The city of Flint, Mich.’s water plant is illuminated by moonlight Jan. 23, 2016. A federal state of emergency has been declared in Flint because of dangerous levels of contamination in the water supply. 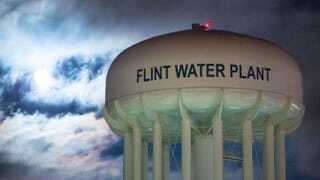 The state of Michigan continues to insult the residents of the city of Flint, who are already enduring what seems to be a never-ending water crisis and the inability to get clean bottled water delivered to their homes without a fight. In its latest faux pas, the Michigan Department of Environmental Quality tried to have an invitation-only town hall meeting on the condition of Flint’s water. You read that correctly. The same state that, according to MLive, went to court to fight against having to deliver clean bottled water to residents who are unable to drink out of the tap figured it would be a good idea to hold a public session with a handpicked group of people. It was only after MLive questioned city and state officials on how attendees were going to be picked for attendance that the organizers of the town hall agreed on Jan. 3 to make the event open to the public. According to MLive, the event in its present state still raises questions. Flint has a population of 99,000 people, and public attendance at the Jan. 11 event at the University of Michigan-Flint Northbank Center is capped at 300 people. This means that in a town of 99,000 people who cannot drink or use water from the tap without a filter, less than 1 percent will be able to attend a town hall meeting and hear about the condition of the water in their city. The state is offering a live stream of the event, but as MLive points out, how many people will be able to find the live stream? And given that 40 percent of the city’s population is living below the poverty level, how many will have internet access to even view the live stream? In other words, the state wants to control any type of possible public outburst or outrage in response to the slow-moving progress being made on the city’s water system. It likely doesn’t want to hear people complaining about both the state and the city trying to back out of delivering clean water to people who need it. The meeting comes as experts from the state and Virginia Tech claim that lead levels have decreased in the city’s water system. Read more at MLive here and here.